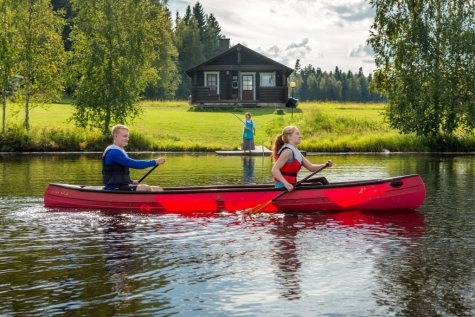 Four charming B&B’s in the heart of Finnish Lakeland, each with their own unique character have pooled their resources and created a series of ‘From Guesthouse to Guesthouse’ tours. The concept has received national acclaim for highlighting the cuisine and beauty of this region. This particular independent cycling tour, allows you to choose a variety of routes ranging from 100-200km and, as your luggage and linen is transferred ahead, you are free to bike (and hike) at your own pace. 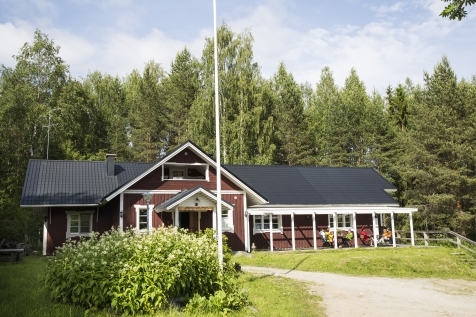 At the end of each day there is a warm welcome from an eager guesthouse owner waiting to serve some delicious Karelian specialities and home-made fare. Fly to Vantaa airport, Helsinki and check in to the Hilton Vantaa airport. The hotel is attached to the terminal allowing you to simply relax before tomorrow’s early flight or time permitting, enable you to head into Helsinki and explore the capital. Take the early morning flight to Kuopio, where you will be met and transferred to the Puukarin Pysäkki Guest House. The 1½ hour transfer gives you a little insight as to some of the scenery that you will enjoy over the coming days. 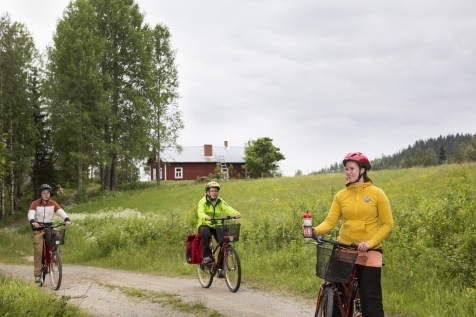 On arrival at Puukarin Pysäkki, collect your hire bikes and helmets before taking a short biking tour to familiarise yourself with the surroundings. Your hosts in the meantime will be preparing a delicious a la carte dinner, Karelian style. Puukarin Pysäkki Guest House comprises of a main log cabin and restaurant complete with sauna and exotic bath barrel. There are a variety of rooms dotted around three buildings (some with private WC/shower). As with all of the properties featured, the owners carefully consider any environmental impact of their business. Vegetables are organically grown, sheep maintain the traditional landscape. They recycle at every opportunity and even do the laundry with soap nuts. Enjoy a natural breakfast and prepare for your first proper foray into the countryside. Today’s route averages 25km. Maps and routes are provided, as is a picnic lunch for you to enjoy along the way. Stop off at the souvenir shop at Marjapaikka and the small town centre of Valtimo before arriving at Karhunpää village. 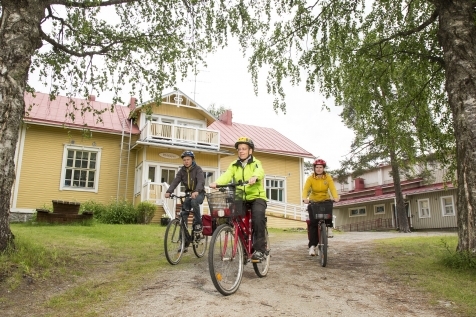 Your hosts at Laitalan Lomat again offer a variety of charming rooms both in the main house and cabins and it goes without saying that sauna’s are on hand to sooth away any initial aches and pains from the cycling. The owners have practiced organic farming since 2010 and this is reflected in this evening’s menu. A further highlight here is that Pasi and Henna can show you the basics of canoeing and you are welcome to paddle along the river either before or after the evening dinner. The planned route today takes you a further 25km. Head for a view atop Nälkömäki or detour around Viemenenjärvi Lake. There is ample time to enjoy a picnic lunch, whilst savouring the natural surroundings. Your room for tonight is at the Pihlajapuu Guest House. This former school is nestled in the woods, next to a small lake and is as peaceful as you can get. There is an in-house sauna, as well as a wood-smoke sauna accessed via canoe. The eco credentials continue here, as does the delightful cuisine masterfully created from as much local produce as possible. After consulting the map, you can see that today you head for Nurmes, via Aronsalmi on the shores of Lake Pielinen. As you cycle through the pristine countryside, you will happen upon Nurmes, perhaps one of the prettiest of the towns in the area. Explore the wooden buildings of the Old Town dating back to 1897, peak inside the Lutheran church, the largest in North Karelia or visit Bomba, a recreation of a Karelian village. Männikkölän Pirtti B&B is your final stop. Famed for its bakery located at the Bomba Market, you can be assured of some delicious dining, including their speciality pies. Depending on the timing of your visit, there are a number of activities in the area including berry and mushroom picking, fishing excursions and even parasailing over the lake. Enjoy an organic breakfast before it is time to hand in the bicycles and return to Kuopio airport for your return flight home to the UK.